Drum Lessons in Manchester - Look for professional Tutors. Do you want to take drum lessons in Manchester? Looking for a drum tutor to help you sound like Steve Gadd, Nate Smith or Ringo Starr? Then why not start taking drum lessons in Manchesterwith one of our experienced, professional drum tutors! Taking drum lessons in Manchester with one of our carefully selected high-quality drum teachers will help you see your skills improve in your drum lessons quickly, whether you’re a beginner or advanced drummer, or anything in between. 50% off the first of your drum lessons in Manchester today. At MusicTutors, we are industry leaders in the areas of Safeguarding and Child Protection. We are the only online platform that requires all of our teachers to have an enhanced DBS Certificate, meaning that we are suppliers of excellent drum lessons that are safe and worry-free for all. Get in touch with one of our drum tutors today for 50% off the first of your drum lessons in Manchester. Why Take Drum Lessons in Manchester? Drums, one of the loudest but undeniably coolest instruments. Needed in every band, and the instrument that lays down the grooves and keeps the group together. What would a band be without its drummer? Not only is taking drum lessons fun, loud, and a great way to release energy and stress but to play the drums confidently and in time develops discipline, practise skills, and motivation. There’s also a great social aspect that comes with playing the drums - most drummers you meet are in more than one band, therefore playing with more people, and making more music! Start drum lessons in Manchester today with one of our great drum tutors and get 50% off the first of your drum lessons in Manchester! Drum Lessons in Manchester Not for You? MusicTutors don't just offer great drum lessons in Manchester - we offer music lessons in a wide range of instruments. Taking drum lessons in Manchester is an awesome idea - drums are the backbone of the band. The unit that keeps everyone together, and the one that gives the groove and feel of the song. However, they have the reputation of being loud, brash and the instrument that parents fear the most! But don’t be alarmed, as well as giving monstrous rock tones, they can be played softly with brushes or mallets. Plus, you can invest in an electric kit, which gives you the option of a quiet house with the noise only coming through headphones! Drum lessons in Manchester are a great way for your child to improve their learning in other areas, too! Choosing your first drum kit is a difficult task. It can help to understand the different parts of the drum, so you can make sure you're getting everything you need! You can talk to your drum tutor in drum lessons in Manchester about buying the right kit! The bass drum is the biggest drum in the kit and is played with a foot pedal. It sits at the centre of the setup. Some bass drums have a hole the size of a roll of duct tape in the front drum head. This allows the air inside the drum to escape and avoids putting too much pressure on the front drum head. This also allows for dampening the sound of the drum - try it out by folding a towel and lying it inside the bass drum, against the front or back drum head. You can change this up depending on what room you're playing in, and what best fits your sound. Your drum tutor can show you how in your drum lessons in Manchester. The highest pitched drum in the kit is called the snare drum. It has strands of metal called snares attached to its underside, which is what gives it its unique sound and makes it great for 'rolls'. The metal snares vibrate against the drum when struck, giving it a multidimensional sound. It's worth spending some time getting to know this drum and how it sounds when you hit it in different ways. The snare is often used as a fundamental part in a basic beat, and you'll be using this a lot in your first drum lessons in Manchester. The hi hat: consists of two cymbals on top of each other. The hi hat can be controlled with the foot pedal and can be struck with the drum sticks also. You can make a shorter, staccato sound by hitting a closed hi hat (with your foot all the way down on the pedal) and a stronger, fuller sound with the hi hat open (foot off the pedal). You can also play just with the pedal - try pressing your foot on the pedal and see what you can do with that sound. For beginners, the hi hat is usually left closed, as using the foot pedal can be difficult to do at the same time as playing. 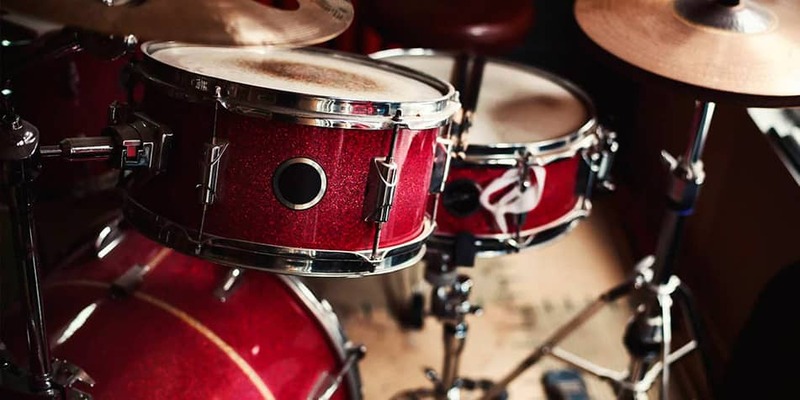 Once you've had a few more drum lessons in Manchester and mastered some beats with the hi hat closed, you can start experimenting with different sounds! When finding the right drumsticks, it's best try out a few different styles and makes to see what's comfortable for you. Most drumsticks are made from hickory wood but they can also be made from maple, oak, aluminium, carbon fiber and plastic. It all depends on the sound you want but the most important things is making sure that they are comfortable to play with. You drum teacher can cover this with you in your drum lessons in Manchester. All manufacturers have a 7A model which is quite light, thin and short. These are great for children. Models 5A and 5B are quite an average size. Here you get more stick and more weight, so they're great for adults playing rock where you'll need to hit the drums harder. Ask your drum tutor about getting the right sticks for your drum lessons in Manchester. Drums sound best if they are placed on stands so that both drum heads can resonate freely. Placing the stands properly ensures there are no other elements effecting the vibration of the drums - for example, if one was against a wall, it could dampen the sound. It's also important to make sure that the toms which sit on the bass drum are suspended without making contact with any other part of the kit. This will ensure a clean sound. The tops of cymbal stands are padded to ensure that there is no contact between the metal from the stand and the cymbal, which could damage the cymbal. There is a plastic or rubber collar on the thread and two pieces of felt which go under and over the cymbal. There is also a winged screw attached on the top so the cymbal does not fall off if gets hit hard. If you are planning to play styles of music which require more powerful playing, investing in durable stands is a good idea to protect your precious drums and cymbals! Your drum tutor can show you how to properly set up your kit in one of your first drum lessons in Manchester. Some stores will sell a beginner kit which includes the full kit (snare, toms, bass drum), hardware (all stands and pedals), as well as cymbals. Other stores will sell the kit and the cymbals separately. It’s worth going into different shops and seeing what they have available. A lot of drummers choose to buy kit separate to hardware so they can get exactly the sound they want from each part of the kit, especially with regards to cymbals. It's worth consulting your drum tutor in your drum lessons in Manchester so you definitely make the right choice! When first starting drum lessons in Manchester, it's important to remember: it’s better to do a simple beat well than a complex one badly. There is a lot of coordination involved with playing the drums which is what makes the instrument so difficult. When you’re learning your first beats/grooves, try to really focus on hitting everything at the right time. Start slow and simple, then you can build up to more complex, faster beats. This is a great starting point to work from - learn more with some drum lessons in Manchester. Practising between your drum lessons in Manchester is vital - but daunting. Just think of practising a musical instrument a bit like starting to go to the gym: when you first go, you can’t lift the heaviest weight - you have to work your way up gradually! It's the same idea with music. For the first couple of months, try practising for 15-20 mins a day. After 6 months, try increasing to 30 mins a day. After a year of playing, maybe try an hour a day. It's better to practise regularly for shorter amounts of time than playing for hours on one day, then not being able to do play for the rest of the week. You don't want to injure yourself, or tire yourself out! Little and often develops your technique and helps you build movement memory. Questions About Drum Lessons in Manchester? 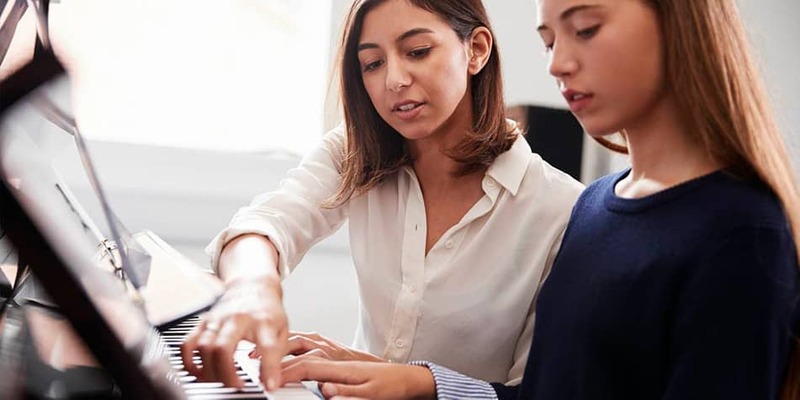 At MusicTutors, we love helping connect students with their perfect tutor. If you have any questions about drum lessons in Manchester, call us on 07946125613 or send us an email to [email protected]. We look forward to hearing from you!